Although she probably hasn’t told you, we’re pretty sure she has plenty of scarves already. Celebrate her originality by giving her a one-of-a-kind gift this year—a hand-marbled porcelain mug or an inviting throw blanket, perhaps? Our Gifts for Her Collection has a gift for every woman on your list, including small accessories, decorative pieces, and more. Be sure to visit the full guide at the Dwell Store, and check out seven of our favorite gift ideas here. By giving a handmade gift this year, you’re helping to celebrate craftsmanship and products with passion behind them. 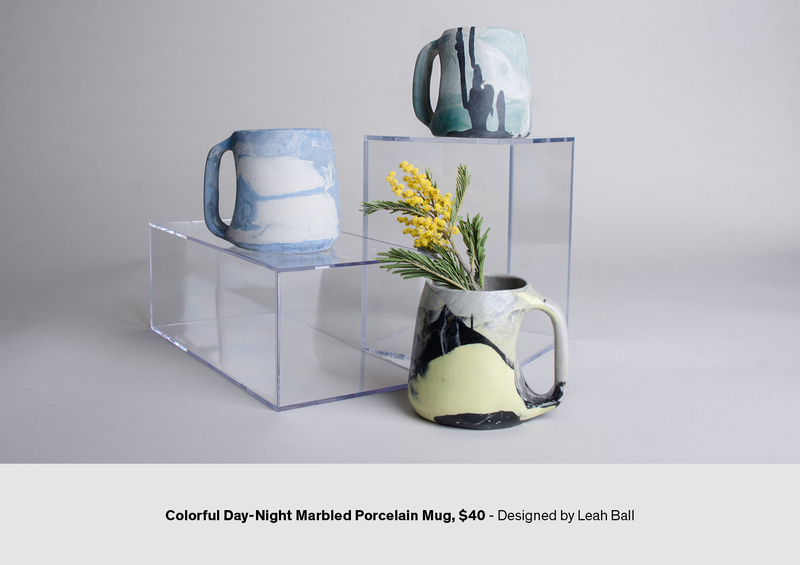 Our assortment of gifts for her includes several handmade items, including Leah Ball’s handmade porcelain mugs. Leah Ball works from her studio in Chicago, Illinois, where she draws inspiration from her childhood town of Carlsbad California. In her distinctive hand marbling process, Ball is inspired by the rhythms of the Pacific coast and the cycles of the sea. To achieve her marbling effect, she uses custom mixed slips and a simple, clear glaze to allow the colors of the marble to shine through. Of her inspirations, she cites psychedelic music, Ikebana, Tom Sachs, Feminist studies, Margaret Atwood, and Midcentury furniture—a wide range of influences that she brings into each of her designs. The Day-Night mug is a truly one-of-a-kind gift that is made with thoughtful craftsmanship and the dedication of the designer who made it. Utilizing her marbling technique, Leah Ball’s Day-Night Porcelain Mug is comprised of two colors of porcelain that have been blended to create a one-of-a-kind look. Each mug is handmade, ensuring that no two mugs are exactly the same. Available in three distinct colorways—blue, chartreuse, and green—this porcelain mug makes a morning cup of coffee into an artful ritual. 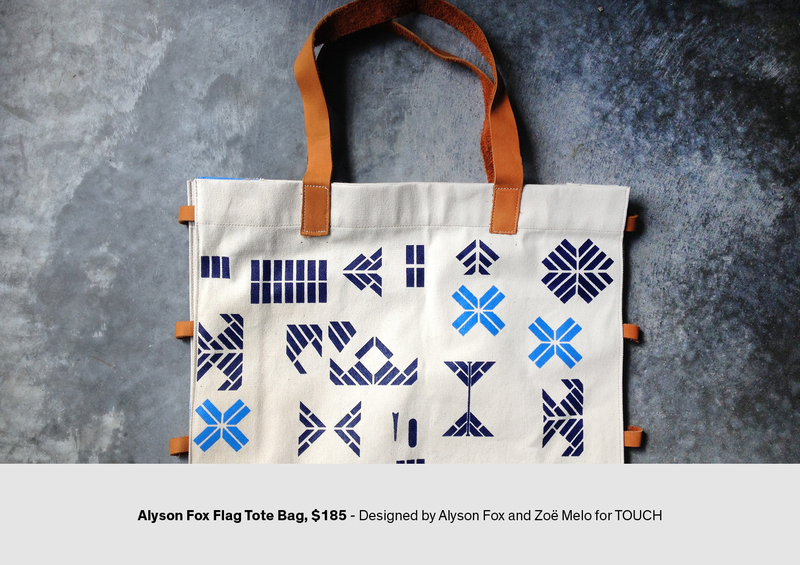 The Flag Tote Bag was designed by Alyson Fox in a collaboration with L.A. design studio TOUCH, marrying a classic tote bag with a bold print. Crafted in canvas with soft leather handles and ties, the tote is defined by its graphic print. The Geo Stands are a distinct departure from traditional photo and card displays. Crafted from solid brass with a brush finish, each sculptural shape has a subtle tilt for displaying a photograph or postcard. 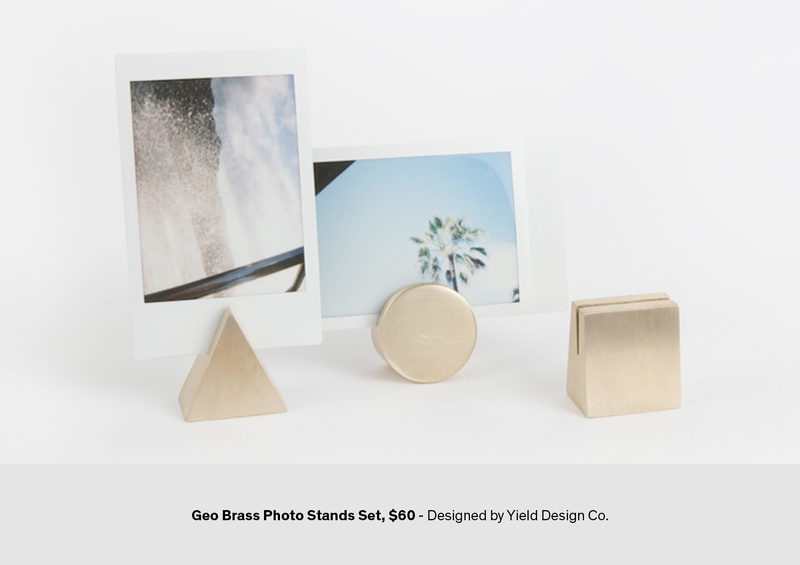 Presented as a set of three, the Geo Stands are weighty enough to be used as a paperweight, and the simple design makes it easy to swap out pictures and cards. 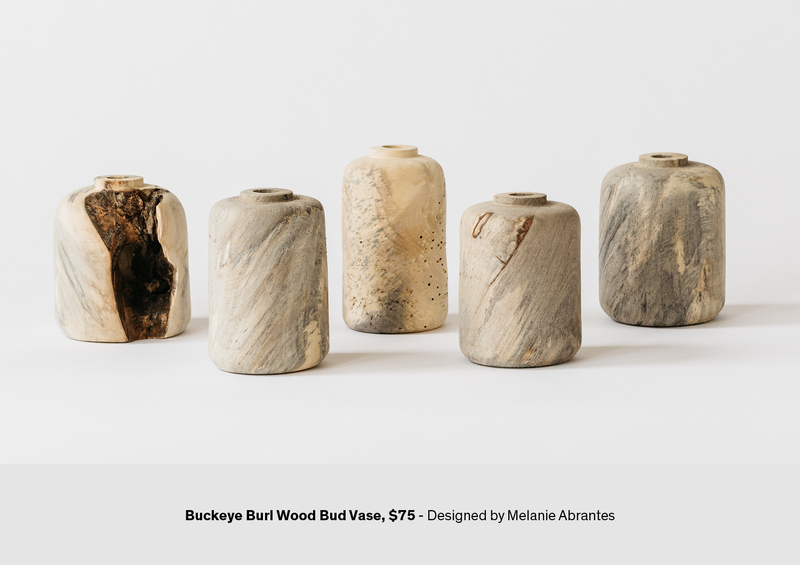 The Buckeye Burl Wood Bud Vase from Melanie Abrantes Design is a one-of-a-kind vase made from a solid piece of buckeye burl, a wood native to California. This wood has a distinctive grain that differs at every angle, making the vase a truly one-of-a-kind piece. Through the technique of lathing, the buckeye burl becomes smooth to the touch, giving this vase a soft feel when in hand. 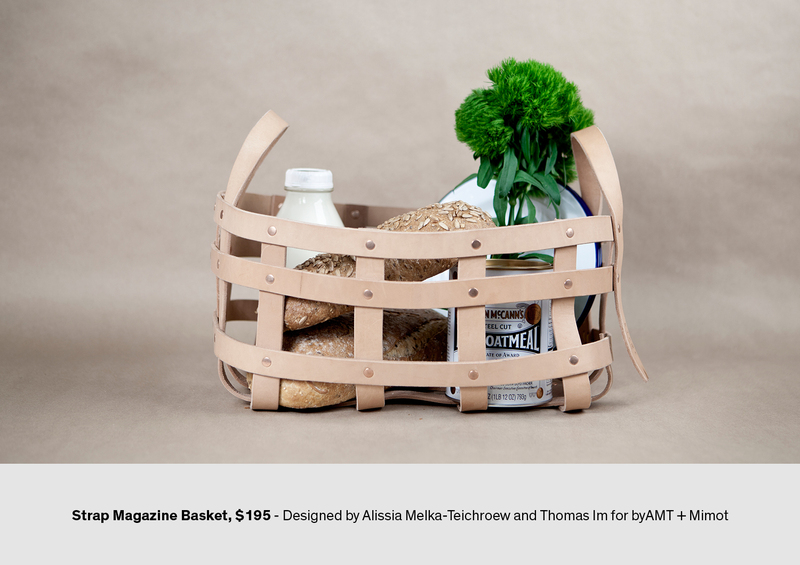 The Strap Magazine Basket is a finely crafted storage option that blends fine materials—luxe leather straps—and a design that is reminiscent of traditional craftsmanship. The basket can be used to hold magazines, towels, firewood, or other items that need organization. The basket is defined by its woven vegetable-tanned leather, copper-plated brass hardware, and yellow cross-stitching—a Dwell Store exclusive. 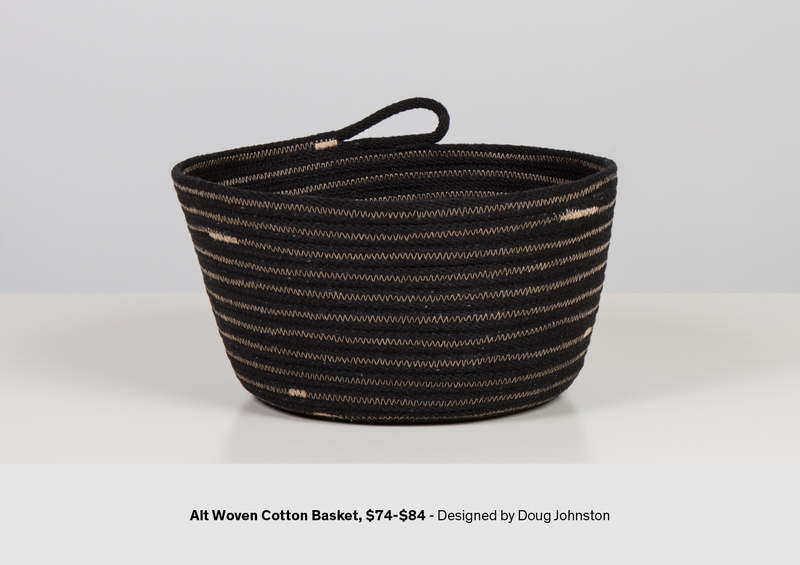 The Alt Woven Cotton Basket from Doug Johnston is a simple accessory designed for storing small and medium items. Available in two neutral colors, each Alt Basket is made by hand from 65 feet of #6 100% cotton cord that is coiled and stitched with sewing thread. In order to achieve the look of the basket, the bowl is made via a helical construction that is more visible with the use of contrasting thread colors. Brooklyn-based Haptic Lab designs intricate quilts of well-known cities across the world. 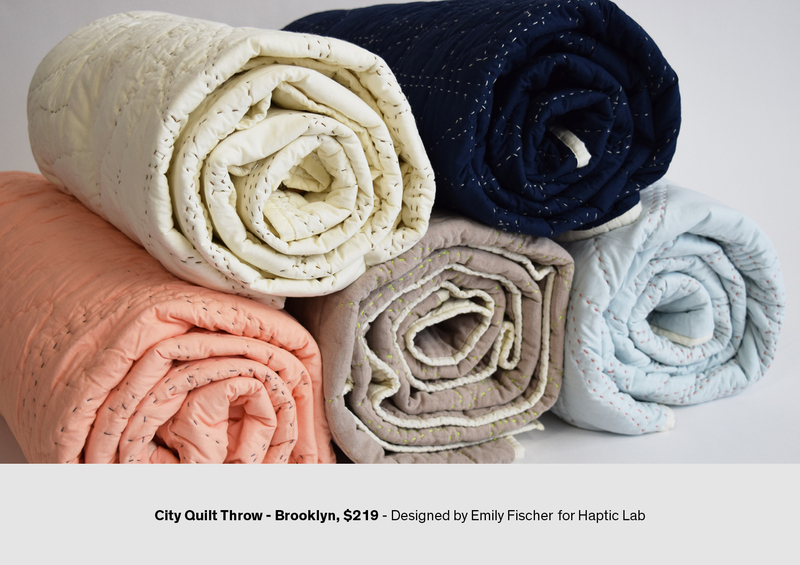 With its Brooklyn City Quilt Throw, Haptic Lab celebrates the neighborhoods of New York’s most populous borough, from Coney Island to Greenpoint. We love Brooklyn–based Haptic Lab Studio, and the story behind it. Architect Emily Fischer was inspired by her mother when she began creating her soft-map quilts. After her mother was diagnosed with glaucoma and macular degeneration while Fischer was studying architecture at the University of Michigan in 2002, she wanted to create designs that moved away from the visual tendencies of architecture. According to Fischer, “As a design student, it occurred to me that architects and designers always privilege the visual over the tactile; design should ideally satisfy a wide range of sensation.” With that idea, Fischer started making her City Map Quilts, intending to be wayfinding tools for the visually impaired as well as cozy blankets. Her Brooklyn City Quilt Throw takes this this idea and brings it to a smaller scale, creating a cozy quilt to curl up with on the sofa, while celebrating New York’s most populous borough. Check out other gifts in our For Her Gift Guide.